By definition, stomatitis means inflammation of the mucos lining in the mouth. In clinical use the term actually describes wide-spread severe oral inflammation (beyond gingivitis and periodontitis) that may also extend into deeper tissues. Various other descriptive terms have also been used to identify oral inflammatory diseases in animals: gingivostomatitis, lymphocytic-plasmacytic gingivostomatitis (LPGS), lymphoplasmacytic stomatitis (LPS), plasmacytic stomatitis, chronic ulcerative paradental stomatitis (CUPS), plasma cell gingivitis-stomatitis-pharyngitis, chronic ulcerative stomatitis, necrotizing stomatitis, feline chronic GS, and chronic gingivitis-stomatitis-faucitis. In cats, the term stomatitis is often used to describe a long term, severe inflammation of the gingiva (gum) and the tissues toward the back of the mouth. The affected areas typically have a bright red appearance, easily bleed, and are often have a cobblestone appearance. Felines with stomatitis are in a significant amount of pain. They often have difficulty chewing. Besides a decrease in eating, pet owners may notice a decrease in grooming habits or a previously social cat that is now withdrawn. 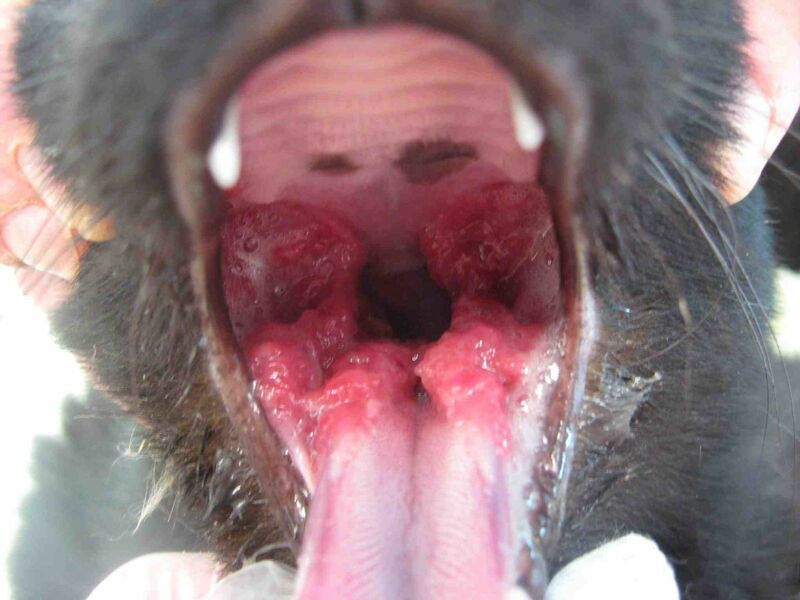 Bad breath, weight loss, and increased drooling can also be noted in a cat suffering from stomatitis. The exact cause of stomatitis is unknown. The role of bacteria, viruses, genetics, nutrition, environment, and domestication in general have all been considered. Recent evidence supports the role of calicivirus in the development of stomatitis. Whatever the trigger, it is generally believed that cats with stomatitis have an altered immune state. Initially an over-reaction to plaque bacteria occurs; instead of typical gingivitis, these cats experience a disproportionate ramped-up reaction. Without intervention, some of these cats progress from this hyper-immune state to a more severe auto-immune disease. In this condition, the body’s immune system actually redirects and inappropriately attacks the cat’s dental tissues themselves. There is no simple laboratory test to diagnose stomatitis. Other causes of oral inflammation should be ruled out, especially the more common gingivitis and periodontitis, which can closely resemble stomatitis. Complete blood work to rule out a variety of systemic diseases is initially performed. Serology to rule out feline viral diseases like feline leukemia (FeLV) and FIV is often performed. A biopsy should be collected to rule out eosinophilic granuloma complex, fungal disease, or squamous cell carcinoma. Early evaluation should also include meticulous teeth cleaning above and below the gum line. Dental x-rays should be performed to check for advanced periodontal disease, tooth resorption, or retained roots that may be inciting inflammation. Finally, a regular and thorough dental home care program should be instituted. 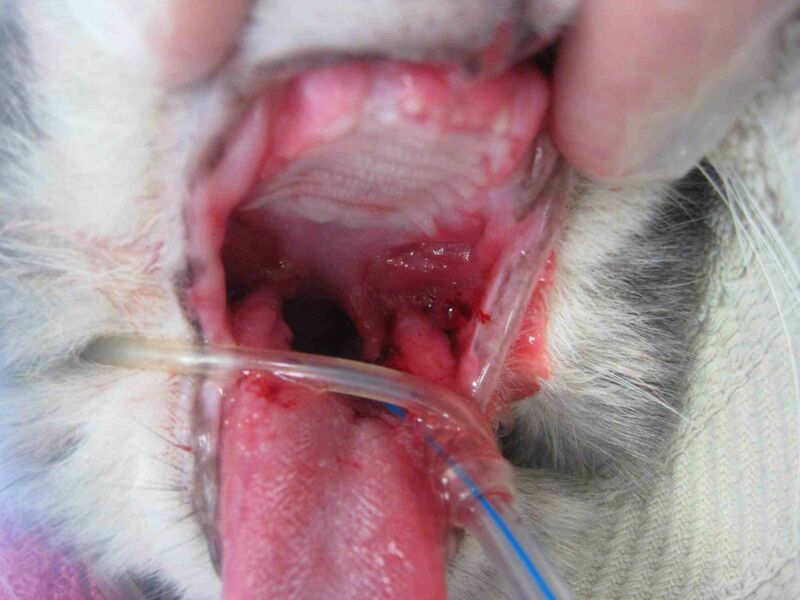 If the initial periodontal management fails, treatment strategies including medical management, oral extractions, laser therapy, and the use of feline omega interferon may be considered. All have all been tried with variable results. Medical management of oral inflammatory disease is aimed at plaque control and modulation of the inflammatory/immune response. Long-term (e.g. 6-8 weeks) or continuous antibiotic administration may result in a decrease in oral inflammation and pain; however, inflammation usual recurs once antibiotics are discontinued and long-term use is generally not recommended. Steroid use generally results in significant improvement of oral inflammation, pain, and appetite but side effects with long-term use are problematic. With chronic use, steroid treatment effectiveness is also lost. Cyclosporine use as a single agent or in combination with steroids has been reported to be successful in the management of some cats with oral inflammatory disease; however, close monitoring of blood levels is required. Since these cats are particularly painful, attempts should be made to find medications that can be administered as a gel to the ear. Two fairly new medications that we have seen great initial success with are EFAC Softgels and Virbagen. Both medications work by modulating local inflammation. EFACstands for Esterified Fatty Acid Complex and is an oral transmucosal fatty acid complex. The fatty acids provide a natural anti-inflammatory effect. Virbagen is a feline recombinant omega interferon.Interferons are naturally produced in the body and help regulate the body’s immune system. When administered as a medication, they have been shown to decrease inflammation and proliferation. Although Virbagen is not commercially available in the United States, it is widely used in many European countries. The use of EFAC or Virbagen can decrease inflammation and pain; their use should be strongly considered before, alongside, or following full mouth extractions. At the present time, oral surgery (near full-mouth or complete extractions) is the most predictable treatment course for providing definitive resolution of feline stomatitis. Oral surgery is frequently performed after medical treatment options are exhausted. Either extraction of all teeth or all teeth behind the canines is performed. The most frequently cited study following complete mouth extraction for stomatitis showed 60% of cats were clinically cured; 20% showed significant improvement with only mild flare-ups; 13% displayed only little improvement and required continued medical management; and 7% showed no improvement at all. In other words, 80% of cats in this study benefited from therapy, and 20% did not (Hennet et al, 1997). Again, it is very important to make sure full mouth extractions are performed by a skilled clinician under the guidance of dental x-rays. If any root tips remain in the mouth, they may continue to cause inflammation. Cats who undergo extraction of most or all teeth are able to live functional and full happy lives. Intermittent laser ablation therapy (every 2-6 months as needed) can also decrease oral inflammation, bacteria, and pain. Laser therapy is most often performed alongside or following extraction therapy.